Since no two mortgages are exactly the same, there are a virtually endless number of variables which can significantly affect the overall cost of your mortgage. A very tiny change in one variable can save you tens of thousands of dollars on the total cost of your mortgage loan and allow you to own your house outright years earlier. The single most important factor in any mortgage is the amount of down payment. In Canada any buyer who cannot pay a minimum of 20% of the value of the residential property in cash on closing requires Canada Mortgage and Housing (CMHC) insurance program, although GE Mortgage Insurance is also acceptable. These companies charge a premium based on the amount of money you are able to place as a down payment. The premiums vary, but the less that you are able to place as a down payment, the more the premium will be. The premiums are also higher for self-employed individuals. Naturally the best way to avoid these premiums is to avoid having to get mortgage insurance in the first place, but many families are simply not able to save a total of 20% when they buy a home. No matter what your financing situation, you should always consult a professional financial advisor prior to making any home mortgage decisions. There are endless types of variable rate mortgages and they should all be approached with a level of caution. Most variable rate mortgages fluctuate in harmony with the prime lending rate. At a time of very low interest rates like right now, variable rate mortgages can be very advantageous. Although most financial experts believe that these rates will stay low for the foreseeable future, there have been times in the past when they have spiked way up. The prime rate is now about 2% but it was over 20% in 1980! 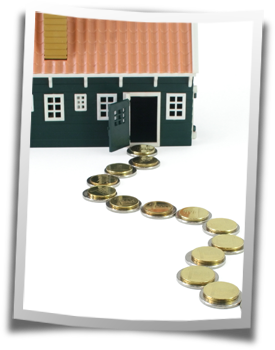 Adding an amount to a monthly mortgage payment can lead to disproportionate savings over the longterm. Selecting a mortgage which is set up to provide you "privilege payments" of 15%, for example, will allow you to pay off up to $15,000 per $100,000 of mortgage each year. Many homeowners still pay monthly as they are not aware of the advantages of paying on a weekly or bi-weekly basis. Just changing the frequency of your payments while essentially not changing the total amount you pay every month at all, can shorten your mortgage by up to four years. Nothing will damage your credit rating and put your home in jeopardy more than making payments late or skipping them altogether. Experts agree that you should always have three months of mortgage payments in your savings for unexpected emergencies. If you are unable to make a payment the worst thing you can do is avoid contact with your lender. Take the initiative to discuss your financial situation with your lending institution and in many cases arrangements can be made to safeguard your property from foreclosure.